It was very good to meet several German students from the distance learning centre at Hamburg for a library induction yesterday. 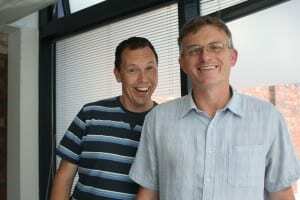 They are studying in Lincoln for two weeks only, with another cohort arriving at the end of the month. As Academic Subject Librarians for the Business School, Martin Osborne (on the left) and myself, Daren Mansfield (the other chap), wish you Viel Glück on your course! Since leaving school many years ago, embarking on several languages other than my native English tongue is an occasional hobby, ranging from Spanish, Greek, Polish and Turkish, but all have been carried out with the same predictable short-term enthusiasm and lack of commitment. So, what caught my eye this month from selecting August’s Book of the Month was the hugely optimistic title: Easy Peasy Chinese: Mandarin Chinese for beginners (2007) by Dorling Kindersley, as though learning a language which is so different than English, is as easy as a walk in the park, or perhaps a pleasant afternoon spent in Beijing’s Shisanling National Park. You might be surprised by this colourfully illustrated book, which is accompanied by a jaunty CD that you’ll have to play several times to get a sense of this language. The trick, if there is one, is to pay attention to the CD and refer to the book without being distracted. If you’re learning a language whilst driving the car then it’s easy to drift off, and you’ve jumped from learning simple tones to the 43rd track bartering for fish at a Chinese market! Without pressing pause and replaying CD tracks it’s easy to skip some key learning. 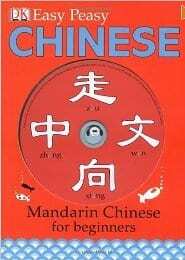 It’s also advisable to borrow other Mandarin Chinese books to support the CD, such a phrasebook listing days of the week, numbers and so forth. If you’d like to start learning Mandarin Chinese as I am trying to, then the book is located at 495.18 eas on the first floor of the Library. 祝你好運 (zhù nǐ háoyùn) – good luck in Mandarin Chinese!